Some years ago, I chanced upon a book. The chancing was a large dollop of serendipity that came in the middle of a casual conversation. Sometimes, serendipity can throw at you what years of careful preparation doesn’t. When I did nestle the book in my hands for the first time, the promise that it held within was wrapped thick in 95 theses that seemed rather simple to read. It didnt reveal, at first look, the scale of influence it would end up having on my line of thought and more importantly the direction of my search, as I continued a restless waddle on the digital thought waves of the new world. The book is a delightful read and made a comprehensive case of the line of thought for the internet in the new world. 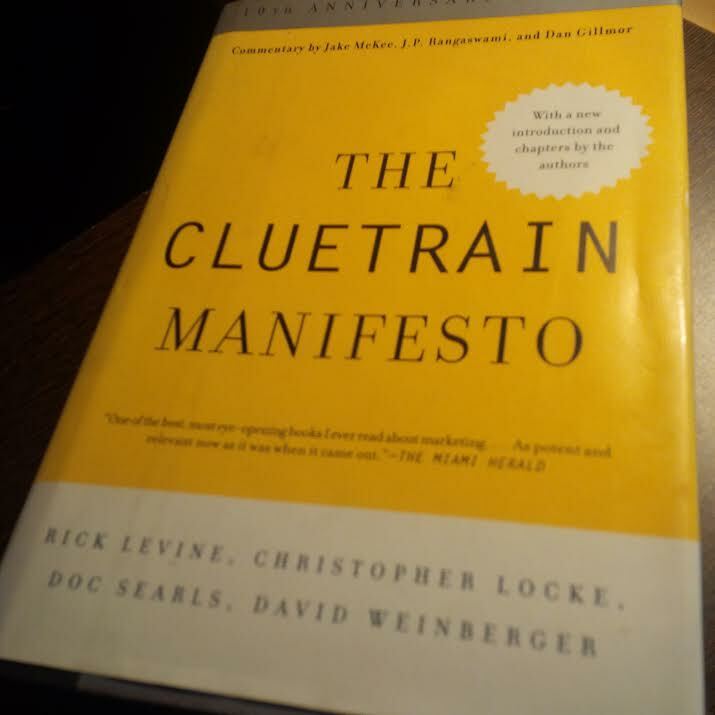 “The Cluetrain Manifesto is a set of 95 theses organized and put forward as a manifesto, or call to action, for all businesses operating within what is suggested to be a newly connected marketplace. The ideas put forward within the manifesto aim to examine the impact of the Internet on both markets (consumers) and organizations. In addition, as both consumers and organizations are able to utilize the Internet and Intranets to establish a previously unavailable level of communication both within and between these two groups, the manifesto suggests that changes will be required from organizations as they respond to the new marketplace environment” – Wikipedia. It was about the internet. It was about how it was going to impact our lives. It was about what it meant to live with the new tools that appeared on the horizons of the connected world and in a flash, got a permanent presence in homes and offices! The book was published in 1996 and chance brought me to it more than ten years later. The predictions of the quartet comprising of Rick Levine, Doc Searls, David Weinberger and Christopher Locke seemed not only praiseworthy but were prescient in the sharpness of the observations. As I read, and re-read, recommended, spoke of, wrote about, designed work and programs with these, my own ideas morphed beyond the book. Yet, the book and the ideas in the book remained significantly important. To me, proof of someone in the digital space (and slowly extended to any and every domain) was worth their salt, was an appreciation of the central themes and ideas in the book. They could disagree with the idea or even dismiss it. But if they didnt know about the book or were ignorant of the core ideas it contained, well, they had work cut out for them. You may say thats extreme, but thats how important I see this work to be. There is reason for me to bring this up now. Two of the authors Doc Searls and David Weinberger have come together to write “New Clues“. For the times that we are in now. I have been reading and soaking it up. There remains work to be done. A ton of it. “It’s something between the noise of a rocket leaving the launchpad and the rip of Velcro as you undo a too-tight garment” they write. Amidst 121 other new theses. In a format that introduced the original idea. From the times of the early internet things have emerged. Our realities and context has shifted enough for us to stand on a ledge, a precipice of sorts. A precipice that has emerged where there was a solid ground just a while ago. A new narrative is required. New conversations are so needed. I am sharing this with you, so that the next time we meet or chat, our coffee will be richer with this new conversation. About the new clues. The puzzling maze that our connected world provides, is filled with an array of possibilities, dilemmas and such else that it needs new narratives to navigate. Narratives that we will script. The ‘New Clues‘ will help.